Today we made good progress. I went out with a plan. First I lunged Dressy for 15 minutes. In a surcingle and side reins. Got her relaxed and walking and trotting slowly and politely. Then went back in and tacked her up for a ride. We did some circles in the round pen. Then did circles around the outside of the round pen. Then did circles in the corner of the corn field. Then serpentines back and forth across the top of the field. Then more circles. Then more serpentines. For 40 minutes we went round and round and back and forth. Once she was fully relaxed and walking on a long rein in every direction and at every stage. And she could transition to a couple of steps of trot and back down to walk calmly…. then we went all the way around the field. She walked perfectly until the last corner, when a big rattly truck went by and she wanted to rush directly up the hill towards home. So we went around and around and around in that corner until she was willing to put her head back down, bend, and walk on a loose rein. Then I let her walk up the hill. I’ve no doubt that she’ll try it again tomorrow mind you… just to make sure I really mean to go round and round truly ENDLESSLY until she walks. Even if there really are monsters lurking nearby ready to eat her. After all the ice we’ve had this month, Dressy hasn’t been out nearly as much as I had hoped for. But I did finally manage to get out yesterday and today. The footing is vastly improved. On Saturday it got warm enough to make the ice kind of mushy on top, and then it snowed. So the snow stuck to the wet ice, and has pretty much eliminated all the slick spots. Yesterday, Misha came out on Diego for a lap around the front field first. She wasn’t feeling too well, so she went back to the barn after that, and I carried on to the back field with Dressy. Dressy felt that having one of her subjects abandon her to the ravening wolves who surely live in that back field was just plain WRONG. It’s Diego’s job, as one of Dressy’s minions, to be eaten first. So that was a snorty speedwalking lap. I got her around and back home , and then took her to the round pen where we did quite a bit of circling and a few other exercises to reinstall her brain. Then we went back out and worked our way around the front field again. This time, doing circling exercises as we went. It did seem to help somewhat. She was still excited, but all her bids for more speed were frustrated by the circles (which she had to do MORE of every time she put on a burst). Eventually it occurred to her that she really might as well slow down and pay attention. Today was pretty much a repeat of yesterday’s ride, without any company (which was better really… being abandoned mid-ride was apparently quite a shock to her… though obviously that’s one more hole to be addressed in her training). We just went a bit further, and thus did many more circles. Especially once we got back to the yard and she wouldn’t walk up to the barn. We must’ve done about a hundred circles all around the round pen and the front yard. But she did finally walk to the barn politely. I put on too many clothes for today’s ride, thinking that I’d be out there longer. But of course, I was working hard with all the circling and “discussions” about speed. So I worked up a bit of a sweat. And am now feeling rather wilted. I’m going to try to keep up some sort of schooling work every ride for the next while. I’ve neglected that with her lately, and she needs it. I am very concerned that we never repeat the craziness of her first 50… wherein we did the first 12 mile loop in just over an hour (not intentional on my part… just too dumb to prevent it). And I ended up pulling her at the third check when she stopped eating. She was a nightmare to ride that day. That was the day that I realized that I was quite wrong to think she was smart and would take good care of herself. King… now he takes care of himself. King doesn’t even like to work up a sweat. And if it’s a choice between catching a horse ahead, and a juicy patch of grass… the grass will always win. Dressy could and would run herself into the ground if I let her. Chrystal recently got some advice from Becky Hart on exercises for this sort of thing, and we are going to try them with our two (ex-racehorse) mares when I take Dressy over to the Ganaraska Forest for longer conditioning rides in March/April. Over the last couple of days, I’ve seen some things happen (or not happen to be more accurate) with Reno, the orphan foal… now an ex-orphan weanling I guess… that kind of amazed me. Reno has always been an independent little cuss. His mama died the day he was born. And he was pretty much raised by Jen’s semi-obnoxious gelding, Twister, and a bunch of humans with baby bottles. From the beginning, he seemed to be very confident and calm. We had to splint one of his hind legs for a couple of days after he was born so the tendons would relax so he didn’t knuckle over. And he was completely unconcerned at the process. We’d lay him down, and I would hold his head down while the splint was applied in the evening. And he would try to get up once, decide it was not worth fussing over and take a nap instead. No worry, no panic. We have doctored any number of injuries (he is a dummy about sticking his head in places it doesn’t belong) without any concern from him at all. He’s had splints, stitches, wound dressings, oral medications, and scrubbings. Nothing fazes him at all. Okay, wait I take that back… Linda once splashed a bucket of wash water under his tail and he was really QUITE put out about her rudeness. But that’s the only thing I can think of. And it didn’t scare him… just made him very very mad! The other day, I had more evidence of his unflappability. I was walking him up from the pasture by himself to come in for his dinner. I generally move Reno first. Then the other two (much less confident) weanlings come up together. So we’ve come up the hill and into the back of the barn. It has a long straight aisle with a pipe gate across the front door. There is a truck with a delivery of large square hay bales in the courtyard on the other side of the gate. These are the great big bales that you move one at a time with a tractor. They weigh around 500 lbs per bale I think. So just as we reach Reno’s stall door, which is just one stall away from the front door, the driver comes whipping around the back of the truck with two big squares on the tractor loader. Really, one bale is as much as I like to carry at a time, but I guess he was in a hurry. With two bales on the front, you can’t see the tractor at all. It just looks like huge floating bales coming at you. Growling. I hesitated for a moment, clinging to Reno’s lead rope… waiting for the spook. What he actually did was put his ears up. For about a quarter second. Then just marched into his house for dinner. He didn’t flinch, didn’t slow down, didn’t even look at it for more that a very moderately interested moment. Dinner is FAR more important than growling hay monsters. Then yesterday, the boss inadvertently let Al slip through the gate as I was bringing Reno through the pasture gate. I say slip… but really Albert exploded through the gate like a little red rocket. Galloped and bucked around Reno, then bolted into the next paddock. Reno did hesitate for a moment as Al bucked around him. I think he was mostly trying to figure out the shortest route around Al so he could get to his dinner. I just marched him on up and let him into his house. Reno ate happily while the boss and I chased the crazy redhead around. Eventually Al broke the damned gate that we were trying to close him in with. Hit it like a battering ram, twisting the gate right around so the pins were facing the opposite side and some gatepost hardware was bent out of shape. Al was fine (albeit missing some hair of his chest), but very over excited by his adventure. Esmerelda, who had been left in the field through all the shenanigans, was absolutely beside herself and ready to come over the fence. Reno was just finishing up his dinner, having paid absolutely NO attention to any of it. He’s quite a guy. I must take some more pictures of the three of them. Unfortunately I stuck my little camera in King’s feed tub the other day while I was untacking him. Just for a MOMENT you understand. Sigh. Forgot it there and poured wet, sloppy beet pulp all over it. It didn’t survive the trauma. So no photos until I replace that. Brooke came to ride on Saturday, and she brought her new helmet cam with her. This one is a Contour HD. It has a little plate that sticks onto the helmet surface. Not really portable from helmet to helmet. But it seems to have decent image quality. That, of course, is Brooke on Dressy, and me out in front on King. Even more than Dressy dislikes the kimberwick bit, and likes the Myler combo bit, King despises (I mean really DESPISES) the Myler combo bit and likes his own kimberwick. Geez. I made the very grave error of trying the Myler on King today. It did not go well. To put it mildly. I asked him to trot, and that was fine. Then he broke to a canter (he much prefers to canter), and I asked him to slow down. He took a leap, and I had to take a stronger hold. So he bolted. I ran him off the field and into some trees to get him stopped. But it really didn’t end there. We went around and around, with him in a total frenzy. It’s hard to let go of a horse who is trying to bolt away like that. We worked our way around the field, sort of sidepassing (a pretty way of putting it) with the occasional spectacular leap until we got back to the barn. Changed him back into the kimberwick and went out again. Sure enough, he was fine after that. We did some half halts, and some leg yields, and remembered that we actually do know how to be light and responsive and amiable. After he settled down and realized that all was right with his world again, we had a couple of nice controlled rocking horse canters. So much nicer than frenzied zigzag bolting…. For those of you who have normally gaited horses, this is going to seem like a ridiculously small accomplishment. 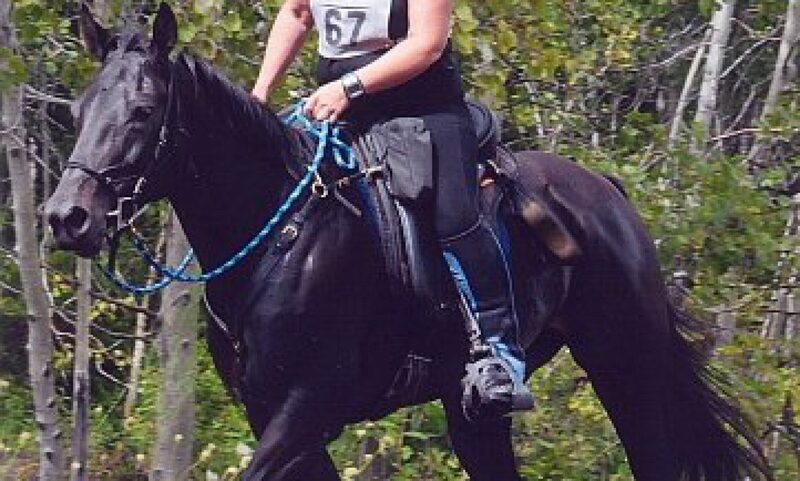 But for my Standardbred ex-pacer, it’s sort of a miracle. Today, while we were out doing laps (boring!) around the cornfield, Dressy felt pretty balanced at one point trotting up a long grade. So I sat down and cued a canter. And she stepped INSTANTLY into it! She’s cantered before, but it’s always taken a few strides, and it’s been more a case of her falling into it, rather than lifting her front end and stepping that hind leg forward into it. It’s been a very difficult gait transition for her. This time it was a very smooth, natural change. I made quite a fuss over her and told her what a very wonderful mare she is. Which she loves. She preens. Yesterday it poured rain here. I think the temperature was around +4C. So the snow all got completely waterlogged. And then that whole mess froze solid overnight. Now there is sheet ice everywhere. It’s supposed to drop to -17 tonight, and only come up to -14 tomorrow. Then by Friday it will be +5 and raining again. No riding today, since I don’t think I could even get a horse out the front of the barn and across the driveway safely. And no riding tomorrow at -14, since the ice will still be here and I would probably wimp out with the wind chill anyway. Some years are good riding years, with safe footing. But sometimes it hovers around freezing, and we get too much ice. I see that the farmer who rents the front field is out harvesting the corn today though. I can access that field without having to cross the driveway. Which means that I may at least be able to do laps around it if we don’t get snow. It’s boring, but it’s something.